Semantic is a development framework that helps to create stunning designs and responsive layouts using very friendly HTML. Now turns towards Bootstrap, it is the most popular framework for developing responsive and mobile based projects on the web. Journey of Bootstrap started 4 years ago and just now Bootstrap 3.3.4 was released. Whereas Semantic UI was released 2 years ago and right now its version 2.0 will be launching soon. 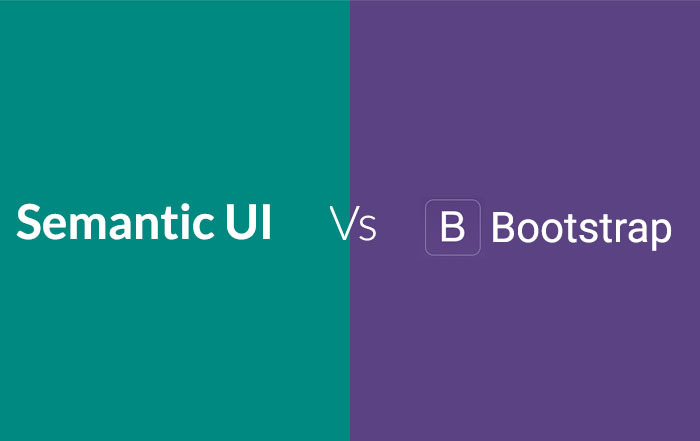 So which is the best one to use in Semantic UI vs Bootstrap? Is there any difference between Semantic UI and Bootstrap? Which is better to build UI, Semantic UI or Bootstrap? Bootstrap is come up as one of the most popular front end framework and open source projects in the world. In last release 3.3.4 versions Bootstrap has been focused on bug fixes and documentation improvements. Semantic UI enters as a rocket with 3000 theming variables, 50 UI components, 3,800 Commits. In Semantic UI vs Bootstrap make it clear that in Semantic UI one can design websites quicker. Redesign Infinitely-: Creating a site in Semantic means you never have to rewrite your codebase from scratch. Redesigning means retooling your UI toolkit, adjusting UI definitions, not creating entirely new HTML layouts. Uniqueness Lack Behind-: Bootstrap is day by day has become super-duper popular. Every web designer and developer has used each and every features in bootstrap. And now time has come that each website is looking similar to another one. Then where is freshness and Uniqueness in website? Off course there are creativity conventions that can be possible with Bootstrap but as It is structured environment one may find it more difficult and inconvenient with tight time bound. Make to you stand out-: Semantic is a modern framework offering almost all you need out-of-the-box to build modern websites. With so new build tools, new ui definitions and many components, the need for third-party add-ons is minimal. Semantic UI vs Bootstrap, I think I can’t see major difference between Bootstrap and Semantic UI. Semantic UI design is better than Bootstrap, more clean, easy to use, strict coding, and useful components, lightweight. I can imagine the future of frameworks in Semantic UI as it is growing very fast. Right now Bootstrap or Foundation is very good option for design layout so one can use Semantic UI as a parallel utility for designing layouts.